The Acadian settlement was established as a result of a ten-year monopoly of the fur trade that was granted by the king of France. The immigrants were all of French Catholic heritage. The expedition set sail from Le Havre in two ships in March of 1604. Two months later the ships made landfall in the area later known as Nova Scotia. Settling in what is now known as the Bay of Fundy, Acadia was born. 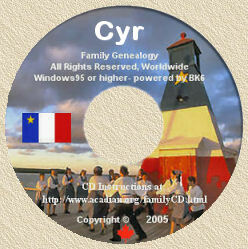 "Une précision...The first settlement of French ancestors...the first ships anchored in New Brunswick, near St-Andrews, near the Maine border, where they spent their first winter in 1604...many died of scorbut, absence of Vitamin D...next spring, in 1605, the remaining French settlers left for Annapolis Royal where the real colonisation took place and where the climate was much milder and more secure during the winter months...but History is correct in saying that the first settlement took place in New Brunswick in 1604, and that the permanent colonisation (settlement) took place in 1605 in Nova Scotia." I am very grateful to Lisa Michaud of the University of Maine in Orono, for having provided me permission to reproduce this article on my web site. The article can also be found on the Franco-American Archives web site.